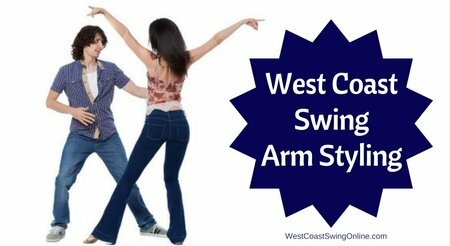 Many dancers want to improve their west coast swing arm styling. If you want to style your arm effectively, you first need to become comfortable with where you arm will end up. This post will help you develop your vocabulary of typical arm positions. We’re going to base our work on the standard ballet arm positions. Although WCS dancers will modify the lines of these positions in order to create more relaxed, “cool” looks, the ballet arm positions provide a great foundation to start with. As you can see, the ballet positions cover the common arm locations: in, out to the side, out and up, in and up, both up, and both down. How does this apply to west coast swing arm styling? Again, it’s unlikely that you will use the ballet positions verbatim in your WCS. Instead, use those positions as foundations for your own positioning. In front of the mirror, play with each position until you find something that looks good on you. There are a couple of general tips for arm locations. Not only do these principles improve the look of the arm, but they also reduce stress on your shoulder. Keep tone in the arm without being stiff. You want to engage the muscles but not make them look tense. Bonus Variations: Once you’ve found a position that looks good on you, practice going to that position repeatedly. You should be able to close your eyes and put yourself into that position consistently. Once you can consistently find that position, you’re ready to work on moving your arm to that position! Watch our ‘Arm Styling’ video on Youtube!